When you hear about “armouries”, you might think that the Royal Armouries is all about weapons in glass cases. But a visit to this spectacular museum will make you think again! Here’s what was displayed at staircase heading to the exhibition. Seriously, the arrangement of weapons is just fascinating! Anyway, there are 5 galleries to explore – War, Tournament, Oriental, Self-Defense and Hunting. In the War Gallery, the first exhibition was some naked men. Yeah, it started with how human learned to fight without clothes. A miniature of a catapult – reminds me of Age of Empires computer game. I always use this to destroy walls and castles! Basically it’s about how human warfare evolve during the Middle Ages. And when gun powder was discovered and improvised, the machine guns were created. All sorts of machine guns are available, cool right? Makes me feel like handling one and shooting at crazy zombies in Left 4 Dead 2! Anyway, while walking around the gallery, here’s what was spotted. A Star Wars Stormtrooper trapped in a glass case. Weapons and characters that exist in fictional movies are also displayed huh. Besides that, interactive displays are located everywhere, therefore allowing visitors to experience hands on with the history. Cool idea. Touch the screen to start but there’s no screen at all. Interactive screen FAIL! By the way, I personally think this is funny. Look. This is the guy from the year 1400. Then it’s the same guy in 1700. Still alive eh. And then in 2000 – it’s still the exact same guy! He’s still alive and kickin! Okay, I know it’s the same guy, probably some employee. But to think that he lived through 600 years in the presentation is just funny! No? The Tournament Gallery includes weapons for tournaments ages ago. There is a display of guns for clay-pigeon shooting. I’ve seen the digital version in gaming arcades. And figures for jousting tournaments. Then, more guns can be seen at the Hunting Gallery. You know, looking at the rifles made me feel like taking one, hunt down some Zombies and shoot the hell out of them! Afterwards, we proceeded to the Oriental Gallery, where weaponry from Asia is featured. The display mainly features the Japanese with their monster-looking headgear and samurai swords. Another prominent feature is the traditional daggers, also known as keris by the natives. All in all, there are lots more to be seen than what I’ve shared here. The visit took almost 3 hours, just imagine how large it is. And towards the end, we were greeted by a body armour. Something’s definitely not right about it. What’s that round thing bulging out between the legs? LOL how many zombie you kill??? 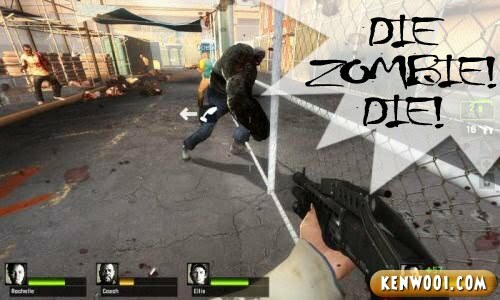 look so serious killing zombie! dont forget to reload! hmm….dats very a war zone! haha..thanks so sharing! wah lau eh…it reminds me of the movie A night At The Museum. really cool ! i love Age of Empires ! i am a loyal fan until the 3rd installment. ♥ nice one! nice sharing! OMG!! !I love the photo which show staircase heading to the exhibition!!!! men naked.my eyes going blind.huhu. well the guy from 1700 till 2000. is he really da same guy.freaking real.lol. and da last pic. lol. Ancient men all naked? Eeee…must be very exciting then! LOL!!! that 1400 guy must have eaten Ambrosia. lol! like play game aneh~ AOE! but the last pict really LOL. WHY SO BIG. hahahahaha, ball of steel LOL. where’s that place?! it looks awesome! Awesome museum! I’m surprised it wasn’t flooded with people. You are not supposed to touch other’s balls! Respect in da hood, yo’. lol…why did they use the same guy??!?! And the ball of steel? haha..hillarious. the art of war~…….you played too much of zombie game! Go go gamers! Jor..all about wars and soldiers.if my hubby happen to be there, such he loves it. kenwooi everything oso wan to touch! OMG! u went to stimulate the ball of steel! HAHAA actually thats the main thing that my eyes focus on when i see the 2nd last picture! awww…. your blog makes me miss my life in UK…. Have been following your blog. But I guess this’s the first time am writing a comment. haha. Great post and keep it up. You’re the next KennySia. I totally attracted with 3rd and last photos! haha… the armour is also an armour of chastity! Precious thingy have to protect lorrr… hahahhahaha! kah kah kah.. love the ending..
the third picture looks amazingly delicious! lol! wish I had steel for balls. LOL! Next time pls pack me along with ur luggage. I’m so dying to go these places. look interesting…being to leeds once but didn’t know about this place..
hahaha. poster boy 6000 is hilarious! lol. probably the balls too big. Zombie…to much of Resident Evil ? what u do at the last picture …? rogol …? Balls of steel eh. That balls must be huge. Haha home of guns and weaponry! Must be a guy’s haven eh? :P And shouldn’t it be BALLS of steel instead of just one ball? LOL! very nice.. but i don’t have money to go there.. hmmm… jealous2!!! hahaha i like the way you end your post! so funny. The place look so amazing. If i only have a chance to visit that place. Hey i like Left 4 dead too! its nice to be here again have a great day! hahahahhahahaha so silly la u….ooo thats y u went to these museum ehhhhh…. Great you steal the show of the steel museum especially your last pic. Love all your pics and thanks for the nice tour. well, i think this is one really interesting museum!!! Lol! ball of steel haha…and the interactive screen also funny hhaha! ohkayyyy.. ball of steel huh.. aiya, need la something like that to cup the user’s balls.. wait not yet fight kena kick there already kiok.. this place is cool.. i so want to go! 3rd pics make me horny.wakakakaka!! nice entry of course. the museum is a hell lot better than the one in M’sia!!! Why can’t we upgrade? @@ gosh~~ the walls are full of those things….